VICAT Needle Apparatus for Cement Testing - This instrument is used for determining the normal consistency and setting times of cement and \'A\' class limes. 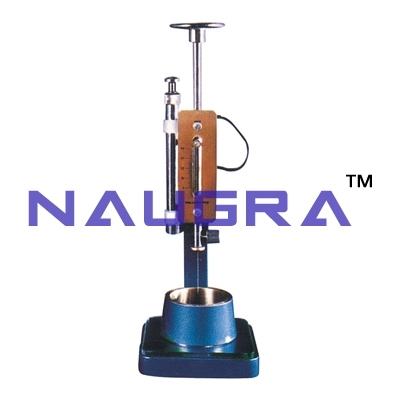 The apparatus consists of a metallic frame bearing a freely movable and with a cap at top, one vicat mould and glass base plate and one set of needles one each initial needle, final needle and consistency plunger..
We are leading manufacturers, suppliers & exporters of VICAT Needle Apparatus For Testing Lab for Cement Testing Lab. Contact us to get high quality designed VICAT Needle Apparatus For Testing Lab for Cement Testing Lab for schools, colleges, universities, research labs, laboratories and various industries. We accept bulk orders for government tenders in all countries around the globe.